So easy to use - anyone can do it. You'll want to know that you will be able to program the robot for the application you have in mind. Most users of ST robots have never programmed a robot before so we offer all the help you need in terms of documentation and support. Acclaimed manuals and tutorial get you through the simplest or most complex tasks. Software support is free and unlimited. RoboForth is not just another robot software. It is a completely different paradigm. Judging from users feedback we believe it is the best robot software on the planet, by far the easiest to use and the fastest to learn. and the elbow axis moves immediately. TEACH, GRIP, ON/OFF, SPEED, RUN and many more words of this nature enable you to immediately operate the arm or the gripper or input/output and thus build up confidence that what you are programming is going to work. It's a building block approach, gaining confidence at each step. RobWin project manager organises and saves your work. Normally Cartesian coordinates are used rather than joint counts. There are commands for this or you can use drop down menus and dialog boxes in RobWin to position the robot at chosen Cartesian coordinates. Further dialog boxes allow you to create named positions (places) or lists of positions (routes) for path following or creation of matrices. 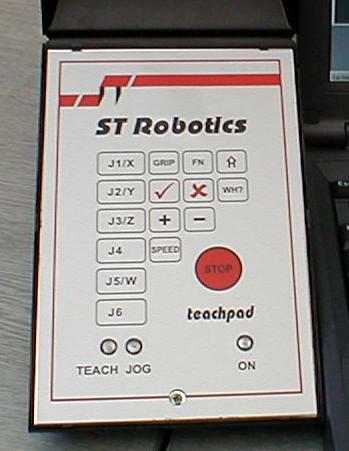 Alternatively you can use our simple free teach pad (left) to position the robot before learning the positions, or our Android bluetooth touch-screen teach console (right). Finally you determine the sequence and conditions in which the robot goes to the learned positions in a text window and the whole thing is linked together and saved together on disk as a named project as well as in the controller's flash memory. Why can't you move the robot by hand then press a learn button? The answer is another question. Can you position a robot to 0.1mm if necessary? Can you maintain the end effector at 90.0 degrees as you move it about? No, teaching by hand (called lead-by-the-nose) seems user friendly at first glance but the real world needs more precision. What if you have a tray containing 100 positions? It is best to let the system calculate them. Some users have 1000s of positions for various reasons, all listed in precise Cartesian coordinates. Why is there no off-line programming? Because it simply doesn't work. The real world is always different from the simulation. The same applies to graphical representations. Why look at an image of the robot when you should be looking at the robot itself and how it works with the real equipment around it. 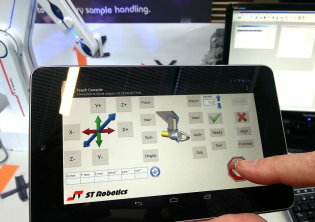 How can I control the robot from my own software? You simply send commands via RS232/USB to the controller from your supervising PC or software. In that case you don't need RobWin. You can use your own software in C, VB, Python or anything else including LabView or Matlab. You can teach the robot some positions or nothing at all; just send coordinates and the robot will go there.